High performance wear-resistant products and systems for the Mining, and Mineral Processing Industries. Corrosion Engineering specializes in serving the mining and aggregate industries with custom products that limit wear, resist impact and abrasion, reduce noise, and minimize maintenance. Our goal is to handle the most challenging problems in ways that save our customers money through greater wear life, enhanced safety, optimized efficiency and reduced downtime. 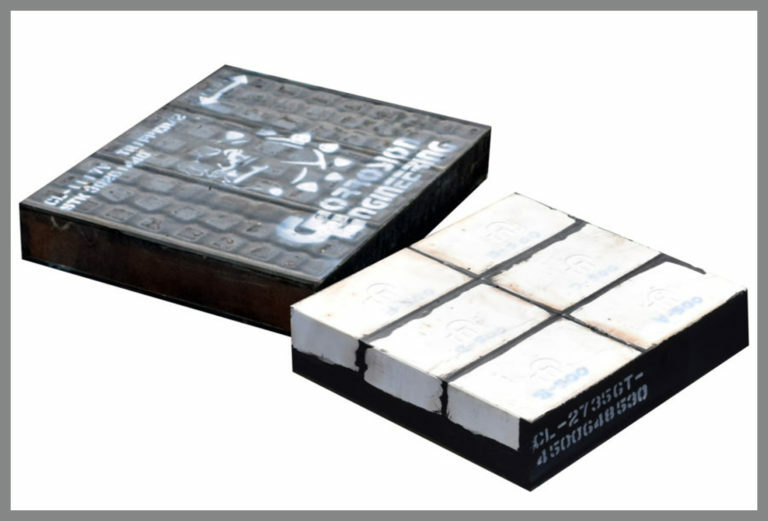 Extremely high-performance impact and wear resistant lining systems which feature the excellent wear resistant properties of high alumina ceramics combined with the superior energy-absorbing characteristics of rubber. Engineered molded-rubber linings from Corrosion Engineering are manufactured using superior high-tensile-strength, high-elongation proprietary rubber compounds to offer cost-effective, versatile components that provide high-performance corrosion, impact, and abrasion resistance. The buildup and plugging of material handling chutes can translate into an increase in periodic maintenance and costly downtime. Inflatable rubber lining systems eliminate the problems of material buildup and plugging of chutes. New Technology developed by Corrosion Engineering now adds a totally new dimension to rubber screens, offering in addition to superior wear life and effective noise reduction, dramatically improved screening efficiencies. Corrosion Engineering understands the importance of conveyor performance and safety. That’s why we design and manufacture premium conveyor sealing products that are extremely effective in containing materials and suppressing dust particulates. Utilizing leading wear technologies, Corrosion Engineering is a leader in providing innovatively engineered wear-resistant piping systems to the mining and mineral processing industries, handling abrasive slurries and mine backfill. Corrosion Engineering has the in-house structural steel fabrication capabilities needed to custom-manufacture an array of material-handling systems.